Subject: Gerry and the Rocks! (or possibly under the rocks). Thank you for yet another great and really up to date edition. You do a fantastic job. 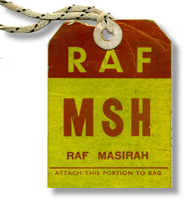 I enjoyed Gerry's article too (“Life Before MAMS” OBB #030711 ) but I think he should be warned to carry a flag of truce when on approach to Stafford as we have a member by the name of Alf (Paddy) Vance, formerly a WO MBE RAF, UKMAMS and also at one time RAF Regiment Flt Sgt; might just be on the warpath with his WMD of sorts! Dave Rose, with Chantel's blessing, has taken over the running of DC's website. As I understand it, the passwords to DC's original site are lost, so I think that Dave Rose has copied much of the stuff and is transferring it to a Facebook site. 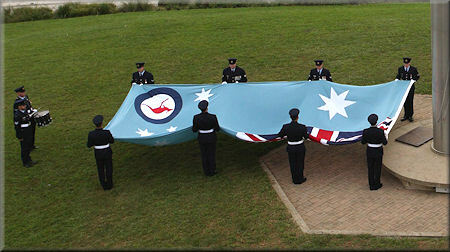 The RAAF has marked its 90th birthday on March 31 with a commemorative service in Canberra which saw the addition of Battle Honours to the RAAF Memorial. Chief of Air Force Air Marshal Mark Binskin said it was important to remember those who had given their lives in RAAF service and recognise their achievements. “Air Force has built some strong traditions over the past 90 years, and I am confident that the people of Air Force will continue to innovate, and embrace emerging technology and capability, to retain our reputation as the ‘best small Air Force in the world,” AIR MSHL Binskin said. Battle Honours unveiled at the RAAF Memorial on Canberra’s ANZAC Parade were for campaigns in the Philippines (1944), Malaya (1948-60), Thai-Malay (1960-66), Malaysia (Confrontation 1962-66), Ubon in Thailand (1962-66), East Timor (1999-2000) and Iraq 2003. I have some good news ref. the subject. I know I should have started this a long time ago, but something always seemed to get in the way. Now the path is clear and I did my first recce today of the Burnsland Cemetery here in Calgary. I talked with the Administration Dept. of City Cemeteries and they gave me a map of the plot layouts. I also got a lot of info off the web about more locations. At present there is about 75 centimeters of snow covering the plots and a lot of the headstones. The only open areas are the roads around it. When things get a little better I will be going in there and getting the pictures you have asked for. In the meantime I will photo copy what I have and forward it to you. Also I am going to e-mail/write the others on the list I forwarded and see if they will photograph the headstones for me and send them to me. Some of the places I will try to get to personally are at Claresholm--Lethbridge--Red Deer. 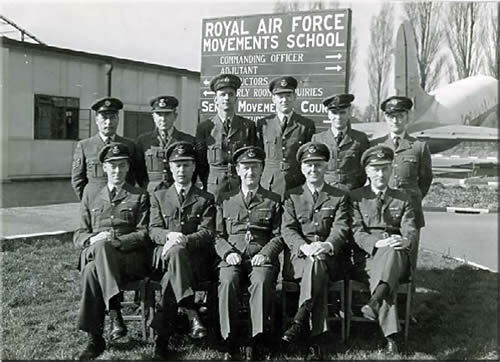 The UK Mystery Photo was taken at the Movements School at RAF Kidbrooke. 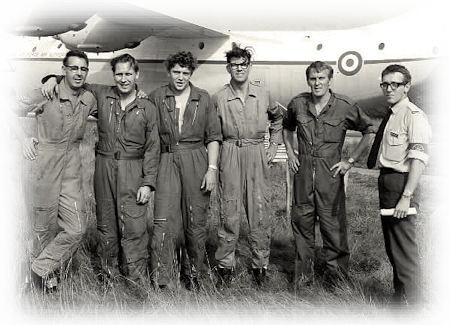 The only names I remember are Back Row 2nd from Left John Pink, Front Row second from Left Flt Lt John Davis who was one of the Flight Commanders. Faces on front row are all familiar but cannot put names to them. I met up with John Pink on my last Posting at MoD Harrogate in 1984 where, as a Group Captain, he was my boss. At Kidbrooke we were taught Land Sea and Air Movements. Our final exercise on the Sea Movements phase was to embark the Royal Scots and their families on Troopship Dunera at Southampton Docks. Quite an experience! The other great thing about Kidbrooke was the railway station was 5 minutes’ walk from our Mess. A quick journey into Charing Cross and London was at your disposal; Raymond Review Bar, the Locarno Dance Hall and Lyons Corner House were amongst a few of the attractions. 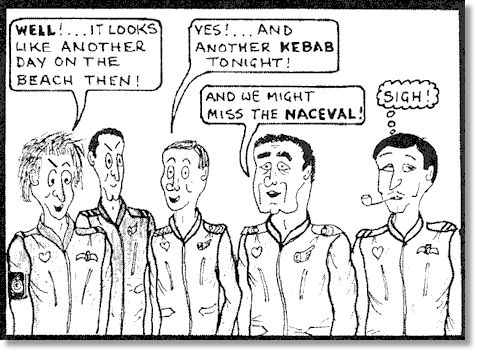 "Oh Happy Days"
I met up with the Royal Scots later whilst I was a DAMO at RAF El Adem in Libya; they were stationed at Tobruk. One memorable occasion was when I was invited to attend a Sunset Ceremony. It was very professionally done and just as the sun went over the horizon the band played their last note, it was as if they had turned the switch off. This was followed by copious amounts of ale. Luckily I lived in Tobruk so did not have far to stagger home after the event. Kidbrooke, circa 1960, that’s me first left in the front row. I was doing a refresher course, especially in Sea Movements which was new to me, before taking up an appointment to the Joint Movements Planning Staff, Middle East Command. 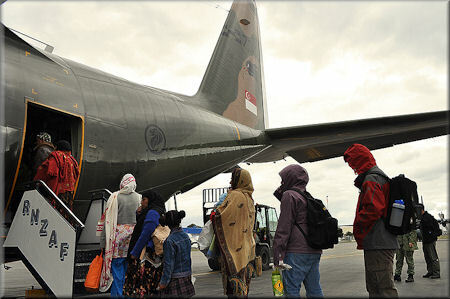 The last elements of the Singapore Armed Forces leave Christchurch today, 16th March 2011, after helping with the quake relief effort. themselves, and he cannot say enough about the Singaporeans' willingness to help. 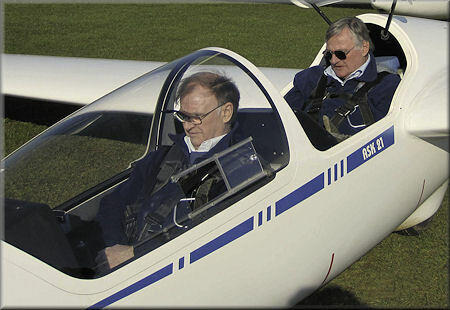 Further to the plea for mug shots, the attached were taken today when I had the opportunity of flying with Bob. On the second flight, managed to get into some thermals which on a beautiful sunny but cold and windy day was a real bonus - finding them was thanks to the man in the back - so... “Ex-Movers soared at Saltby”. 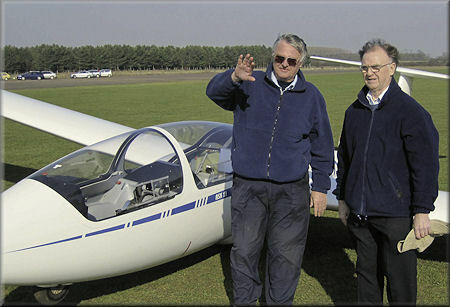 The real benefit of flying with different instructors is getting a different view point and alternative techniques and the reasons why. I don’t think I added any grey hairs to either of us, but I have no doubt that Bob can give his own views. Thanks again Bob, thoroughly enjoyed myself . Our meeting at Cosford this week was, as usual, well attended. Our speaker was Dave Shaw who gave us a talk on the history of WW1, his passion since he was a youngster. He brought with him part of his collection of WW1 items; a German Mauser rifle of that time which took five rounds and our Lee Enfield which was considered better as it held 10 rounds. 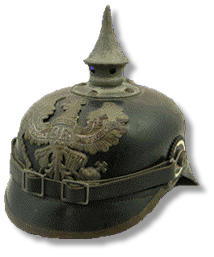 He told us that during the first year of fighting the only headgear that was worn by the Brits was the normal cloth peaked cap and the Germans the 'pickle helmet' made of leather; neither of course gave any protection and he had a sample of both. Amongst his vast collection he showed us a shrapnel shell, a German stick grenade, a British one which was grooved, I thought it was to break it up when it exploded, but it was to give the soldier a better grip so that it wouldn't slip from his hand and blow him up. He has a host of items that he'd collected on his many trips to the battlefield sites, the collectors would go there when the farmers were ploughing their fields when all these items came to the surface; on one occasion a sealed ammo box full of live .303 ammo. The Germans were the first to use gas; the first occasion on French Algerian troops and it completely decimated them; the gap in then defences was taken over by Canadians and the only protection they had were their handkerchiefs soaked in their own urine covering their noses and mouths. He had a huge album containing his collection of silk postcards (I've got a few that were sent by my uncle to his wife to be), some had just a quickly scribbled note but most were blank that the soldiers sent home so at least their families would know that they were still alive. He also had all the WW1 medals lots of cap badges and shoulder flashes. 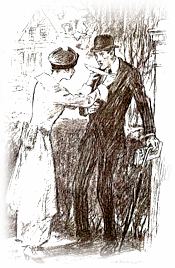 One thing he mentioned that in the first couple of years certain women if they saw a young man in the street would force a white feather on them scolding them for not being in the war. 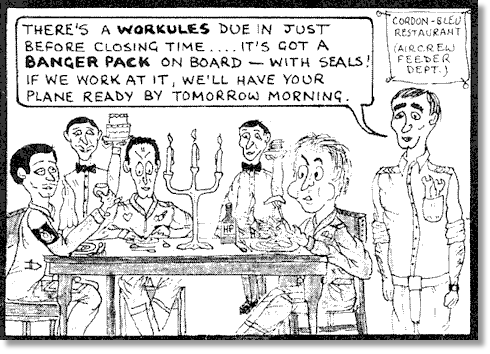 Many were repatriated wounded soldiers or factory workers working on essential war materials. It got so bad that the Government introduced a lapel badge that would be worn by these lads to try and stop this. One story he told us was of a woman in a train who thrust one on a young man; he was a repatriated wounded soldier who had been awarded the VC for saving his the life of his officer on the front, so it had to stop. He travels to the battlefields Mons, Ypres and the Somme every year and of course he visits the war cemeteries, far too many, a lot of them which I've seen in my early travels on the motorbike across France. One thing that gets to him are the headstones that just say “An unknown Soldier of WW1” and there are many thousands of them. I expect you saw on the news that a mass burial ground was found only last year with hundreds of Aussies in it and there is now a massive task to identify them. He said that since then another mass grave has been found. He could have gone on and on but it was time up; he got as far as the end of 1916 so he will return in the future to complete his talk. His told us his house has three bedrooms; room 1, room 2 and then room 3 the museum. We all gave him a standing ovation; he had held our attention all through his talk. The RNZAF mystery photo shows that kiwi’s can actually fly! 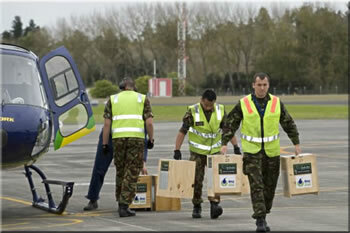 Challenged by the logistics of transporting 30 kiwi over 650 km from Auckland to Masterton, the Department of Conservation (DOC) called on the Royal New Zealand Air Force. 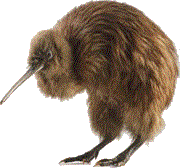 On the morning of 7 May 2010, 15 male and 15 female kiwi were caught on Little Barrier Island and flown by a civilian helicopter to Whenuapai. A C-130 Hercules from No. 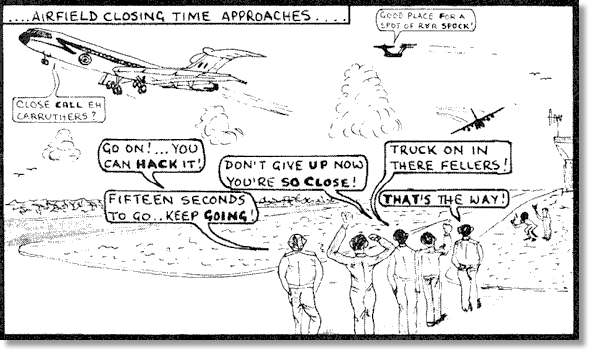 40 Squadron then provided the swift and direct transfer of the kiwi from RNZAF Base Auckland to Hood Aerodrome in Masterton. After a brief photo opportunity, the kiwi were driven to Pukaha Mt Bruce and released into the local reserve forest. Reintroducing kiwi and other rare native species to the forest is part of a major initiative by the Pukaha Mt Bruce Board, DOC, and community and local councils, to restore the Pukaha forest. Depicted in the photo is RNZAF FLT LT Aaron Butler [back on], LAC Jonah Tan [head down] and UK MAMS FLT LT John Smith [RAF - Exercise Longlook exchange to NZ]. You asked for information about operation "Spearhead" and I must tell you that "A" team were on the first Britannia going into Aldergrove on the 15th August 1969. David Benson was our team leader along with Flight Sergeant John Evans, Sergeant Tony Pyne, Corporal ??? Myself and SAC Alan Pratt. 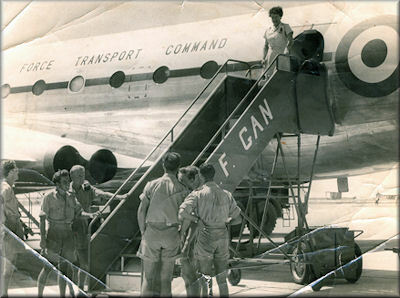 We worked through the first night unloading Britannia aircraft (a mixture of Army personal and freight). From memory we were the only team receiving the first wave of aircraft and we returned to the UK on the 18th August. 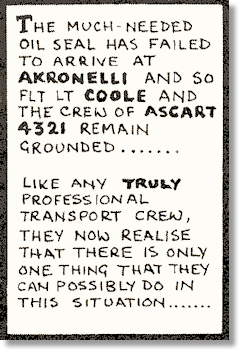 Having read Tim Newstead’s comments on "Operation Shoveller" where he asks what other team was operating, it was once again "A" team who assisted with half a dozen trips into Jordon. I'm just back from London and the Maldives (SCUBA diving). Had a great time altho' the complexion of the UK has certainly changed! Which reminds me, I spent a lovely day in Gan once, in 1964. We were on a low-budget training trip. We could go anywhere we wanted as long as we stayed in "Government Quarters," so we stayed in Gan on the way to SIN. 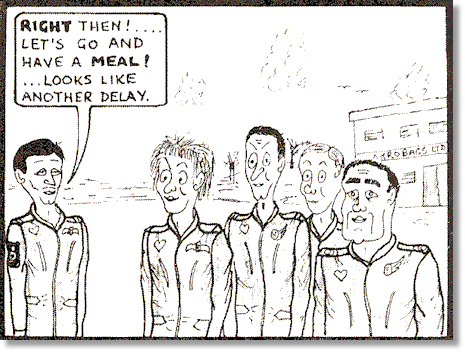 As I recall the RAF troops worked from 0400 to about 1100 due to the heat. They also looked forward to visits of the female Air Loadmasters with bated whatever. The locals, working on the base, came to work from the other atolls in war canoes. Quite a sight! Bristol Airport's Managing Director (MD), would go out of his way to negotiate special financial deals to either attract or keep airlines based with us. Paramount Airways operated a fleet of MD 83 aircraft out of Bristol Airport between 1987 & 1990. We were understandably over the moon at getting a based airline with us. These deals were supposed to be confidential commercial undertakings, but somehow word would get out about their special concessions, much to the annoyance of agents and other operators. 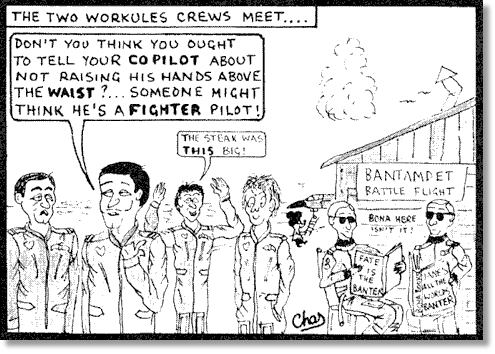 Civil Aviation is a cutthroat business. During previous years different airlines came and went, most of them going bust. So this was a prize for us and meant that our passenger figures would rise together with our profits. 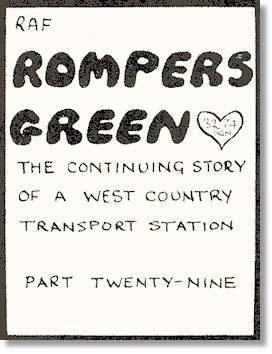 I should point out that at this time, there was very little to offer at Bristol. There was, and still is, no large hangar. Also at that time our fuel holding capacity was very limited, together with no Instrument Landing System (ILS) and only 6600 feet of runway to play with. Aircraft parking was also limited. Trying to provide additional new accommodation, or indeed any sort of change to the planed layout of the infrastructure, is time consuming and subject to local opposition and the dreaded planning applications. This is still the situation today. The special deal for Paramount used to infuriate us in Terminal Management, as the passenger numbers increased we had to try and give some sort of guidance in the use of our limited passenger facilities. The departure lounge was, on many occasions, bursting at the seams. To top it off there were insufficient car parking spaces. The handling agencies and Paramount would not adhere to agreed procedures for calling passengers to the lounge, totally ignoring our requests and only being concerned about their own aircraft turnarounds. This of course caused many passenger complaints, either in writing or in person, which I, together with my colleagues, had to deal with. 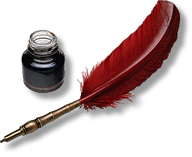 We developed a ‘Customer Complaint Form’ which created much letter writing. All had to be answered by whoever was on shift at the time. These letters, and there were lots of them, took up most of the time on night shifts which were busy enough as it was. Regular meetings were arranged to sort out all these problems; minutes taken and procedures updated and agreed upon. But alas, at the end of the day they were totally ignored. The overall underlying atmosphere at the airport was one of animosity and pure hatred between different individuals of different companies. It all came to a head one day when the MD of Paramount Airways was informed by his fellow directors at a board meeting that he had, as a result of his of his unorthodox management style, been voted off the board. This gentleman was a bit miffed about all this, as he had put in 11 and a half million pounds of his own money into forming the airline. As a result, he worked a flanker with the company accounts, transferring all of his cash back into his account. 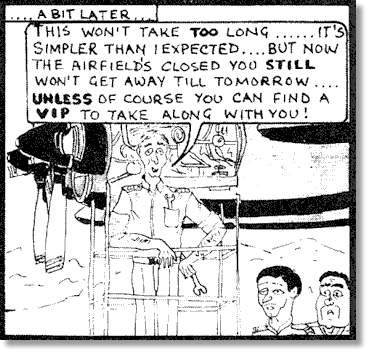 He then promptly disappeared off the scene to somewhere in the United States, leaving the airline bankrupt. Overnight some 400 people were quite unceremoniously without a job, causing much heart renting and upset, not to mention all of the passengers throughout Europe who were now stranded. As a result, the airport was many millions of pounds out of pocket. Liens were placed on those aircraft currently at Bristol until a satisfactory agreement was reached. After about 2 years, Paramount’s ex-MD eventually re-entered the country, was arrested and duly sentenced for this selfish undertaking. I write this account of the demise of this airline to show you the fickleness of some of those in high positions, who have vast amounts of cash, but suffer from vanity and pure greed. Some more photos from the latest Meet & Greet at the RAFA Club in Swindon. It was good to see Merv Cork there again after a long absence and also 'Dutch' Holland taking time out from flying big jets. Thanks for the Google MAMS Map, very interesting to see how far we are spread around the world. 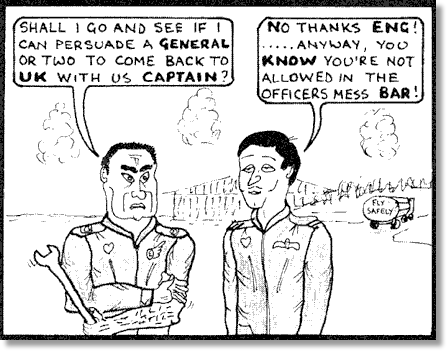 The situation in Libya stems from the time when Col Gaddafi was a young man and was sent by the then King Idris to Britain to the British Army's Mons officer training school at Aldershot. He was 27 and very self-centred over how he should be treated. Therefore, it wasn't long before he fell out with the directing staff. In his disgust he moved his belongings out of the officers' mess and then erected a Bedouin tent on the cricket pitch with the express wish that he would live there for the rest of his stay. This caused all hell to let loose not only had the sacred cricket pitch been ruined but that this junior officer had done this in flagrant disregard to the orders that he was given. It wasn't long before signals were passing between the British Government and the Kingdom of Libya the outcome being that Lt Gaddafi was recalled to Libya; judicially, he had just completed his course as a signals officer so the time was ripe anyway! The incident put the foundation in Gaddafi's mind that the British were scurrilous infidels and that has remained with him to this day. Where we are going and what the outcome will be of the current crisis in Libya; rest assured the Col will not go quietly! Subject: Thanks from the Sandifords. Terry (Sandy's wife) and the Sons, Michael and Andre, would like to thank all who attended Sandy's funeral, for the cards received and messages by e-mail which I copied and gave to the family. They also wish to thank you Tony for your help and support. 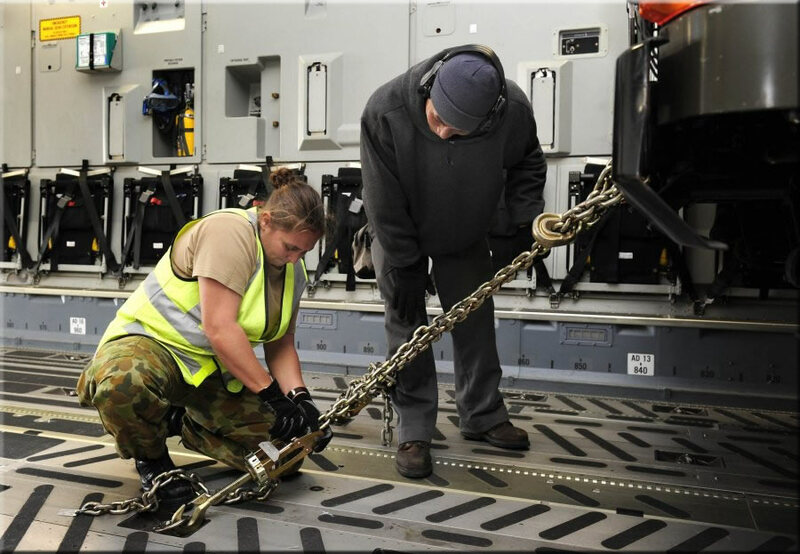 The Royal Australian Air Force (RAAF) delivered vital pumping equipment to Japan to assist containment efforts at the Fukishima nuclear power plant. The equipment, delivered on Tuesday the 22nd of March, is part of a remotely operated water cannon system from Perth and is based on a series of pumps and trailers that can be remotely manoeuvred into location to provide continuous water suppression. Two RAAF C-17A Globemasters arrived at Yokota Air Base with the system, making a total of three RAAF C-17A Globemasters contributing to Operation Pacific Assist – the ADF contribution to the Australian Government’s response to the earthquake and tsunami relief effort in Japan. The operation took place at the request of the United States and Japanese Governments. Japanese authorities have now assumed the responsibility of transporting the equipment from Yokota Air Base to the Fukishima nuclear power plant. Group Captain Tony McCormack, Commander of the United Nations Command (Rear), said the impressive task highlighted the value of the C-17A Globemaster and the ADF’s ability to respond quickly to short notice tasks. “Having this pumping equipment delivered demonstrates the utility and capability of a C-17A. “The fact that it was able to be loaded with such a large load in Perth last night [21st March] and then flown all the way to Japan, shows we can react very quickly to a demand,” he said. Just would like to take the opportunity to say that I do like the new OBA Earth one slight problem with my entry my correct post code is NG2 6GP present post code places me on the bank of the river Trent, nice place to visit on a summers day but a bit cold at this time of the year. An outstanding effort, Tony. Thanks a lot! What a great addition to your already fabulous site. Many thanks. What a fantastic idea! Although I’m not an active scribe to the site, I look forward to keeping abreast of things when the brief arrives in my inbox. Thank you for all your hard work, please keep it up. Outstanding! Thank you Tony. I am stranded in Houston at the moment and this has helped pass the time waiting for the next flight. It looks real good Tony, but I haven't gone into too much detail yet. Could you update my address as I have recently moved. Thanks Tony - mighty impressive! Tony Tony Tony... OBA Earth is Amazing!!! 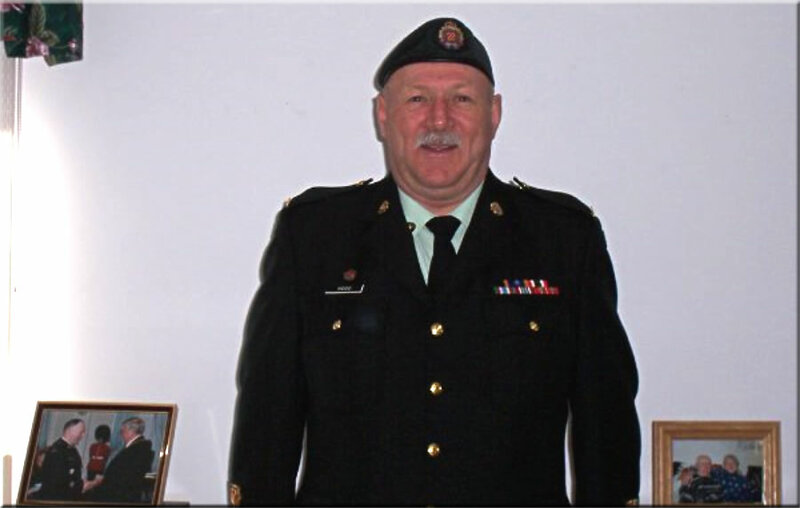 There is an Old Bod in my home town, North Rustico, I didn't know he was a mover I will have to go see him this week!! It’s great to see where everybody is! Just been going around OBA Earth. Great new toy once you get used to the zoom button. What a brilliant piece of work -the OBA is alive. The world-wide spread of ex-movers is astonishing. Excellent piece of work. Very interesting to see where we are all spread. You have been a busy man! It is very impressive and I took your advice and ran it in Firefox. (In IE it did not work properly.) I found it fascinating not just to find our upside down cousins in Aussie and NZ but who was living virtually next door. It must have taken a long time to set up but it is a fine piece of work. Many thanks. I am still honorary President of the UKMAMS Association but Colin Allen has been doing a great job as Chairman. He has the support of the Committee but does the ‘lions share’ himself. He has not been at all well this year but his determination and cheerfulness are a fine example to us all. 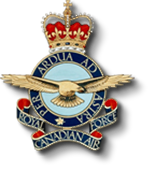 He will stand down as Chairman after the “Big Weekend” of 20-21 May at RAF Lyneham but I am pleased to hear that he, and others who have also done their share on the Committee, has found volunteers to carry the Association forward. A re-invigorated Committee and new website should assure the future of the Association in the years to come. I hope your health is improving as you have also had a rough time and I wish you all the best with your excellent website that fills a real need amongst Movers around the world. Great project! Just goes to prove Movers are worldwide. What a brilliant concept - top marks for putting it together. I have to admit that it brought back long forgotten memories of the low tech world map poster (with colour coded pins for places visited) on the wall of my room in Dakota Block, Lyneham. And I don't mind confessing that I had (& probably still do have somewhere in an MFO box) a flying hours log book too, all those many moons ago ! What a sad man I am. Great job on the OBA Earth and the newsletter which is a really useful way to keep in touch with what is going on around the world. You have me located in Dieppe New Brunswick. I relocated in Apr 07 to Saint John New Brunswick & I haven’t been in touch with Ade Ryan yet! Using your complete street address in the pin information block places your pin onto the exact geographical position of your home on the map. This is useful if someone wants to get driving directions to your home... just hover your cursor next to the name of the person in the information block and it will turn into a hand. Left click once and a separate screen will open enabling you to get driving directions. If anyone else wants their full address shown in the information block just let me know. Thank you for your World program. Easy to use and I found a local member whose detail I had misplaced - very quickly. Makes the real world not too big after all. Well done. Brilliant ! I’ve only taken time to have an initial play thus far but find it really impressive. One question - How secure are the email addresses from scammers ? See you’re back in the snow again. Good question Jack. The e-mail addresses are not shown in the database entries below the map, they are only shown in the pin information blocks and that information is on the server and not contained in the page source code. In other words, if a hacker wanted to get the e-mail addresses for scamming purposes he would have to click on each individual pin and copy them manually - far too labour intensive to be worthwhile. Some of the original manuscripts of this series of cartoons have not aged too well, and this is one of them. Every effort has been made to enhance the quality but alas, even the magic of PhotoShop cannot restore them to their former glory.